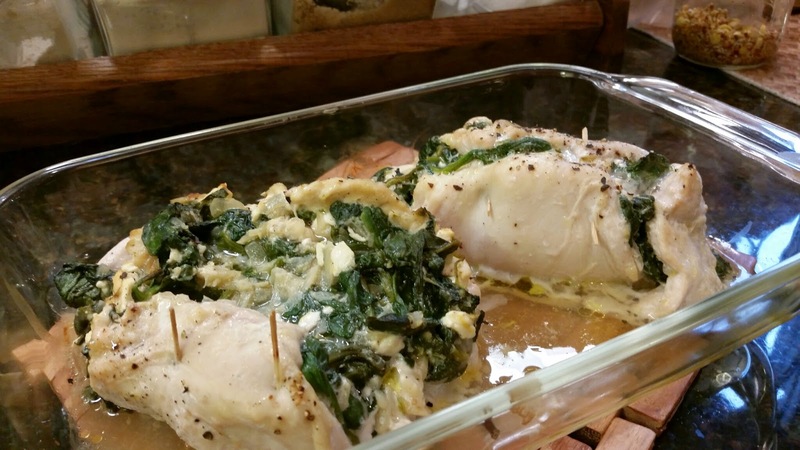 I've made the Sun-Dried Tomato, Spinach, and Feta Stuffed Chicken Breasts several times since I first tried them. The flavor is just so good. Unfortunately I'm out of sun-dried tomatoes, but I did want to try some different flavors in my stuffed chicken breasts. So I went looking for a recipe to change it up a bit but still use the spinach and feta. The addition of the lemon zest in this recipe caught my attention right away. I also added just a touch of lemon juice, and I think the flavor turned out great. Heat oil in large nonstick skillet over medium high heat; add onions and garlic, and cook until onions become translucent. Add spinach and continue cooking until spinach is wilted. Turn off heat and stir in lemon zest, lemon juice, salt & pepper, and feta. Set aside. Place a chicken breast between two sheets of plastic wrap and pound with a mallet or the bottom of a heavy pan until breast is about 1/4" thick. 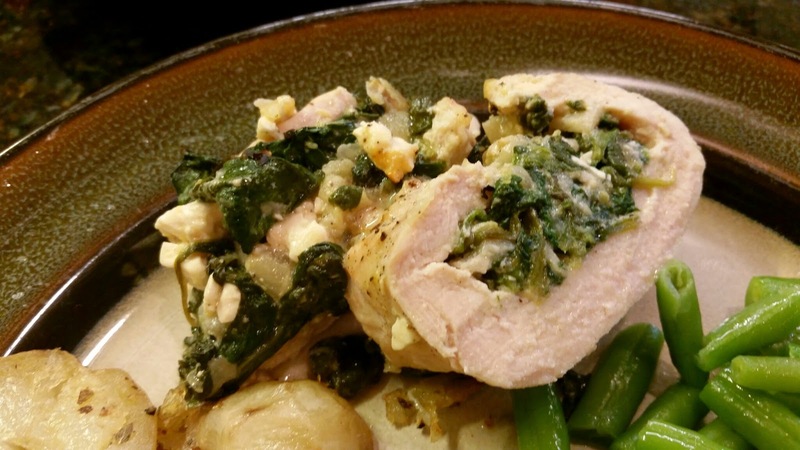 Spread half of spinach/feta mixture on chicken breast. Roll chicken breast up, starting with the narrowest end. Secure with toothpicks and transfer to a baking dish. Repeat process with second breast. Drizzle the breasts with olive oil, sprinkle with salt and pepper, and bake at 350° F for 30 minutes. Let sit for 5 minutes; Remove toothpicks, slice and serve. Spoon a little of the cooking juices over the top, if desired. The recipe said to cook the chicken breasts in the skillet after rolling them up, turning them occasionally to get the chicken browned and cooked through. I don't roll my chicken breasts up well enough to feel that I wouldn't just lose all the filling if I tried that. There is a lot of filling! So I just placed my chicken in a baking dish and baked it. Super simple, which I love. The skillet-cooked breasts might get a little browner, but you'll notice that my toothpicks came loose on at least one of the chicken breasts, so I probably would have had filling everywhere. It probably would have tasted just as good, though. I'll definitely be using this filling again. 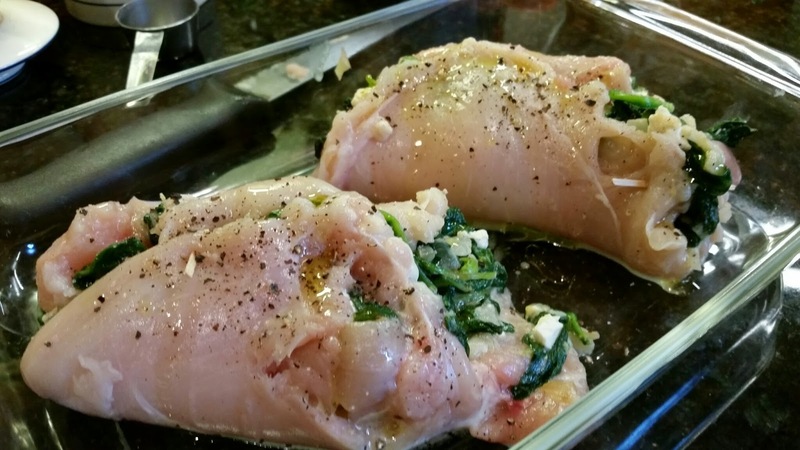 (I'm kind of obsessed with spinach right now) I'm also a dark meat chicken kinda gal, but these stuffed chicken breasts turn out really moist and flavorful.